It was time for leading nail lacquer brand, O.P.I. - a long time beauty partner of New York Fashion Week - to bring what was happening backstage, to the forefront in a strategic social media campaign. To celebrate the nail lacquer brand's prominent footprint at New York Fashion Week in 2015, we focused on creating a digital presence that encapsulated the feeling and energy of fashion's prime moment. As such, we created a narrative roadmap for sharing the pre-show and at-show experience, from the inspirations that guide what hits the runway, to the value in such integrated brand alignments. We started by developing a series of videos exclusively for Instagram that aimed to further explain the relevancy of these integrations. The four-part video series, featuring OPI's founder, Suzi, spoke to the influences of beauty in fashion, the importance of these integral brand alignments, and the sentiment behind their presence year after year. 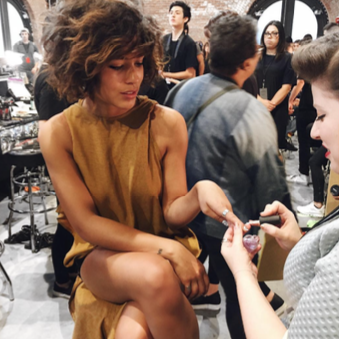 To bring the otherwise exclusive and behind the scenes backstage beauty experience to the masses, we aligned the brand with two leading fashion influencers who's sole mission was to share their experience of Fashion Week through the beauty lens of O.P.I. Both shared on the brands owned channels, and the individual influencers, the impressions racked high, and engagement hit all time peaks. The campaign garnered more than 5 million social media impressions for the brand in just two days, and all video content received more than 85,000 views, creating one of the most digitally successful NYFW campaign periods to date.